Salon is a quaint kasbah in southern Awadh (in today’s Uttar Pradesh). This area has been home to some of the most influential sufis and ulama over the last few centuries. These men of God, who also happened to be men of extraordinary learning and erudition, settled down amidst a rolling sea of humanity steeped in polytheistic, animist, monist, immanentist and all manner of esoteric beliefs. It was the self-imposed “duty” of these sufis and ulama to practise and propagate Islam in such a milieu. It was like mixing oil and water, the oil of the strictly monotheistic Islam with the water of a bewildering array of theisms. God knows these sons of Islam did try very hard – as hard as Sesephus – to accomplish the impossible. And they did succeed at it. 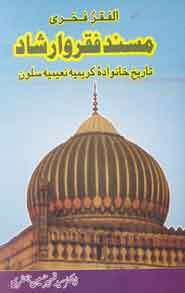 This book is a painstaking effort to document and reconstruct the history, day-to-day activities and quintessential features of the spiritual tradition of the famous Khanqah Karimia at Salon, the abode of a long line of sufis and ulama of a single clan. The founding saint of the khanqah (this word can loosely be translated as an Islamic monastery or convent, although it is neither) was Shah Pir Mohammad, a spiritual disciple of the Chishti saint Shah Abdul Karim (d. 1648). The founding saint was virtually tailor-made to work in an esoteric environment. Shah Pir Mohammad was not only well-versed in the intricacies of the Nizamia-Chishtia order, but in Qadriya, Suharwardiya, Naqshbandiya, Madariya and Imamiya Sadatia as well. That is formidable spiritual accomplishment even from classical standards. He did put all that to good use in the small, dusty place, indistinguishable from the rest of the surrounding countryside, except perhaps for the hillock where he set his hermitage. The ordinary village folk in Salon and surrounding areas knew them only as Mian Sahab or Shahji, but the lineage of pirs of the Karimiya khanqah was respected by the Muslim nawabs of Awadh and the Mughal emperor in Delhi. The British, to their credit, did continue with the due courtesies, except for occasional conflicts. The pirs here, like most other sufis anywhere else, did spurn royal patronage and court appearances. Being rooted in Awadh’s soil, they were pained at the peasantry’s plight, which made them stand on the people’s side in the 1857 uprising. The sufis living in humility here were not just the Mian Sahabs of the simple peasantry of the area but men highly sought after by the royalty at Delhi’s Mughal durbar and the vizier-nawab’s provincial court in Lucknow. These extraordinary men of piety were not to be swayed by either the courteous entreaties of the mighty Mughals or by the personal devotion and regard they received from the nawabs at Lucknow. To a courteous invitation from Emperor Aurangzeb to visit Delhi durbar, the saint at Salon wrote back: “This fakir can’t muster the courage (to visit the court). What does this rustic has got to do with royal company…. Our Lord the Merciful is enough (for this fakir), everything else is mere vanity.” The fakir could get away with such a flat rejection of royal honours. The stern Aurangzeb, to his credit, did not take it to his heart. These men of God had devoted themselves to the service of common humanity, shunning name and fame, but somehow fame seemed to relentlessly pursue them. An interesting example is that of an 18th century Urdu poet, Qalandar Bakhsh Jur’at, a contemporary of Mir Taqi Mir (he finds a mention in the seminal Zikr-e Mir). This poet has left an impressive corpus of his work, but he wrote only three poems in the qasida (euology) genre. The three persons thus marked for adulation were: Hazrat Ali; the poet’s contemporary saint at Salon, Hazrat Shah Karim Ata; and Prince Suleiman Shikoh of Delhi’s Mughal royalty residing in Lucknow. For a writer handling such divine-inspired lives it is easy to slip into hagiography. Somehow, this writer has been able to keep himself steady on such a slippery terrain thanks largely to his education and training in historiography: he is a professor of history in Delhi University. To avoid being drowned in a rolling sea of sufi spiritualism Prof. Jaffri stays clear of the miracles of the saints of Salon. Miracles as such seem to go against the grain of the spirit of the age, but matters are not helped by the distinctions Muslims make between different classes of miracles ranging from miracles of God (ayaat), miracles of the prophets (mo’jezaat), miracles of saints (karamaat) and miracles of ordinary believers (kashf). It was a wise decision to leave this part largely untouched because it would have required an entirely different kind of a book to be written. It is interesting to note that Prof. Jaffri has avoided treading the path of saintly miracles not because he can’t grasp such issues, but simply because they are likely to stretch credibility too far in the contemporary milieu. It is not that the Salon saints had not wrought enough miracles of their own, for what are saints minus miracles? Prof. Jaffri is well-suited to document the rhythms of life at Salon khanqah and the chiaroscuro of existence as faithful servants of Allah because he happens to be the scion of the Salon pirs, who trace their lineage on their father’s side to Hazrat Omar and to Hazrat Imam Husain on their mother’s side. Hazrat Shah Naim Ata, the eighth sajjadahnashin, prophesied and willed, “the office of the sajjadahnashin that so far had a Faruqi face and Alavi character will, after me, God willing, change to an Alavi face and Faruqi character”. Hazrat Shah Naim Ata represents, in many ways, a watershed in the Salon tradition, enrich as he did it with an amazingly long tenure of 66 years at the helm of affairs. Pirs from the two sides have headed the khanqah over the last three centuries. The Jaffris (Husainis) took over the stewardship in the second half of the 20th century and continue to do so. It is a well-documented and nicely produced book which is interesting in more ways than one: it can also be read as a helpful guide to the history of Awadh and for gaining insights into the sociology of those three centuries.